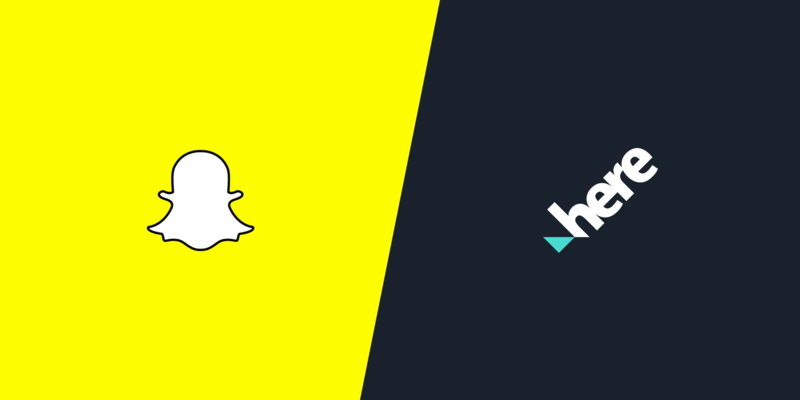 Earlier this month, Snap released its developer kit, allowing developers to harness some of Snapchat's features and content. Snap Kit enables developers to include a "Login with Snapchat" button at login, send content to the Snapchat camera, display public Snapchat Stories outside the app, and use Bitmoji outside the app. In this tutorial, we'll be focusing on the Creative Kit component of Snap Kit for iOS. Creative Kit lets developers send custom 3rd party content into the Snapchat app to be used as stickers and overlays. We'll be creating a demo iOS app that lets a user insert a map of the iPhone's current location as a Snapchat sticker. In order to achieve this, we'll take advantage of the nifty HERE Map Image API. Our Head of Developer Relations, Mithun Dhar, smiling for the camera. Sound fun? Let's get started! Go ahead and register on both of those sites. Don't worry, they're both free! Navigate to SnapKit > Docs > Downloads and download the iOS SDKs. Go ahead and unzip the file while we're at this step, since we'll be using the frameworks in Xcode shortly. It's time to fire up Xcode and start coding! Create a new single view project. Using "File > Add files to..." in the top menu bar, select both "SCSDKCoreKit.framework" and "SCSDKCreativeKit.framework" from your downloads folder (or the directory they were downloaded to). Once that is complete, we'll need to edit and add some information in the Info.plist file. I prefer to edit as source code (right click > Open As > Source Code), but this can be done in the default Property List view as well. The first few entries are Snap Kit related, while the last two have to do with accessing the native location APIs in iOS. 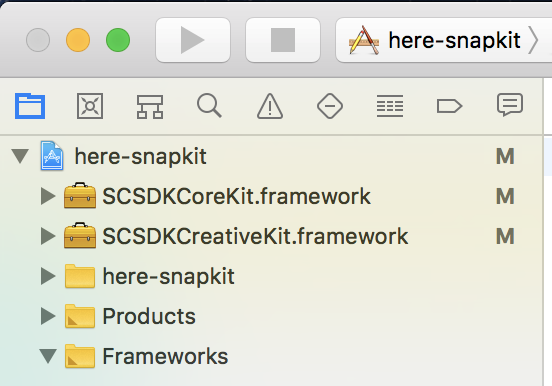 Make sure to swap YOUR-SNAPKIT-KEY with the Snap Kit development key you copied in the previous section. Now that our info.plist is configured, we need to configure some additional information for Snap Kit to function properly. Caution, your app will not work if Snapchat doesn't have these two pieces of information! The first component of the app we'll tackle is the native iOS location services. We've already configured some of the necessary location privacy properties in the Info.plist, so we can dive straight into some code. Don't forget to add the "Import CoreLocation" in the header and "CLLocationManagerDelegate" in the class declaration. I won't dive into how iOS CoreLocation works in this tutorial. If you're interested in learning more, I recommend taking a look at Andrew's Tutorial: Location Services. Now that we've written the necessary code to access the iPhone's location, let's work on getting the Map Image API setup. The Map Image API is fairly straightforward; it returns a static map image of a location (coordinates). Additionally, it can do some advanced features like appending markers and polygons onto the map canvas. It wouldn't hurt to get familiar with the API by checking out the documentation, but if you prefer to live life dangerously, feel free to keep moving on. Be sure to replace "YOUR-HERE-APP-ID" and "YOUR-HERE-APP-CODE" with your HERE app id and code. Set some parameters for the Map Image API, such as the zoom level, the image quality, the marker type, and the map style. All of these can be customized. Now, whenever our app requires a ready-to-go map image, we have a function prepared to provide it! We'll be using this in the next section. We'll now take a look at the code required to send a sticker to Snapchat. Voila! And just like that, you've created a location-enabled Snapchat sticker app! 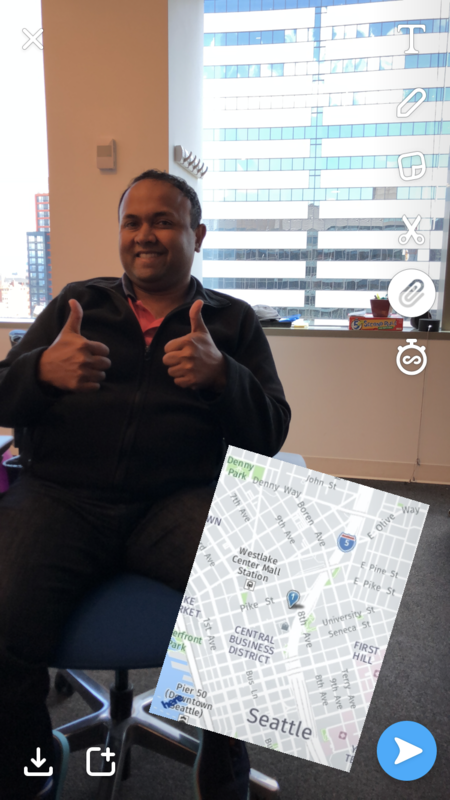 Let us know your experience building location-enabled Snapchat stickers in the comments below. Fork or clone the project on Github. For more interesting location technology content, follow @dbabbs or @heredev on Twitter.